This year, 286,000 Ohio youth will be involved in 4-H -- a non-formal educational program for youth ages 5-19. 4-H is the largest youth organization in the country. 4-H'ers learn by doing as they participate in projects and many other activities designed to help them develop as individuals and become responsible, productive members of society. All 4-H programs focus on active involvement and experiences which stimulate lifelong learning of values and skill. Volunteers are vital to the success of 4-H activities. In Ohio, 25,000 volunteers contribute nearly one million hours to 4-H each year. Their knowledge, enthusiasm and leadership help 4-H build the foundation that prepares young people for the future. 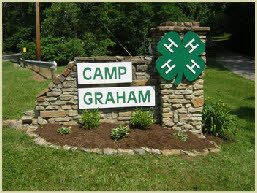 4-H Camp Graham is located on 70 acres of rolling woodlands along the Todd's Fork in southwestern Ohio. Our goal is to provide a safe, rustic woodland environment where youth and caring adults learn and play, developing life skills through hands-on educational programs, while making friendships that last a lifetime. 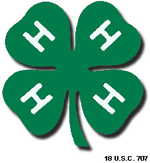 We are proud to be owned by the 4-H members in Clermont, Hamilton, Montgomery and Warren counties.